Baise horses (also known as the Guangxi) are a pony-sized horse native to the Guangxi region of China, where the climate is mild and horse breeding has long been common practice. Like other Asian breeds (the Mongolian horse in particular), they thrive at high altitudes and roams freely when not working. They have obvious physical ties with Mongolian animals. Guangxi's mild climate has long favored horse breeding. Bronze statues from 206 to 25 B.C. have been found that look almost exactly like this animal in confirmation. Baise horses are an average height of 11 to 11.2 hands (44 to 46 inches, 112 to 117 cm). They are smaller than other breeds in northern and western China. Their head is heavy, with a straight profile and wide jaw; they have a medium-length neck, running down to straight shoulders. Their legs are strong and well-developed, with strong hooves. Ttheir usual coat colors are black, chestnut, gray, and bay. Baise horses are strong and quick with a willing, able temperament. They are used as a riding and pack horse for tourism, on the farm and in harness; it is also used for meat. Baise horses have always been an important part of the local residents and were an integral part of traditional marriage celebrations. 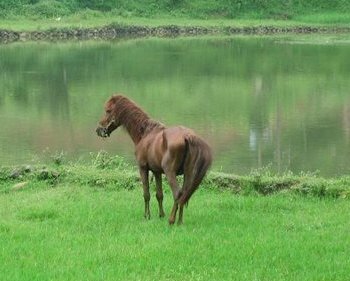 The National Baise Horse Genetic Resources Conservation Area is a protected area in Guangxi.